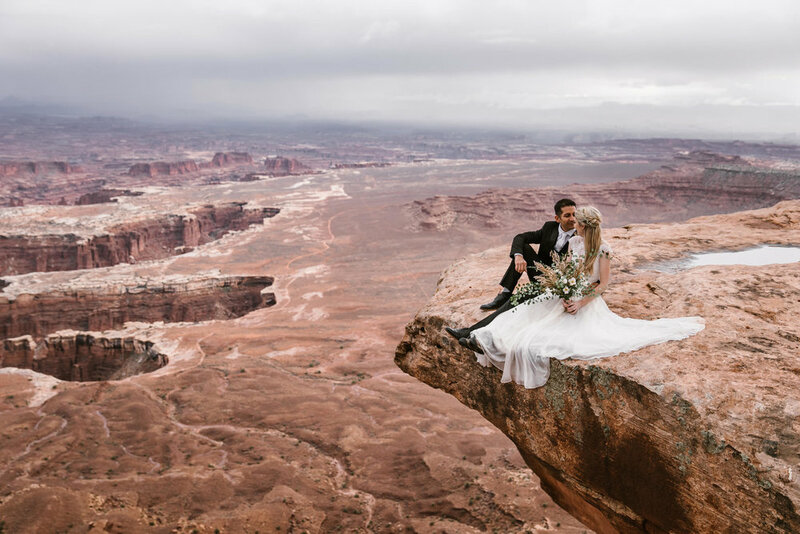 What is Amangiri, and Why you should consider an adventure elopement or having your destination honeymoon there. 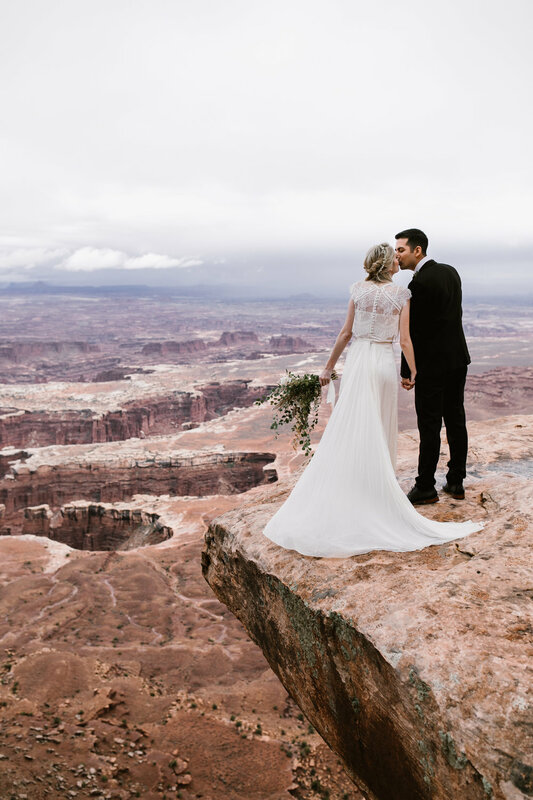 Considering we’re adventure elopement photographers, a lot of our couples decide to combine their wedding and honeymoon into one epic trip! I mean, if you’re going to elope in a gorgeous destination, why not spend more time there and make a honeymoon out of it too? Or, you can cross two places off your bucket list, and plan a destination honeymoon somewhere different than where you got married — it’s up to you! Honestly, that’s the beauty of planning a wedding; you get to make the decisions and do what feels the most true to yourself. 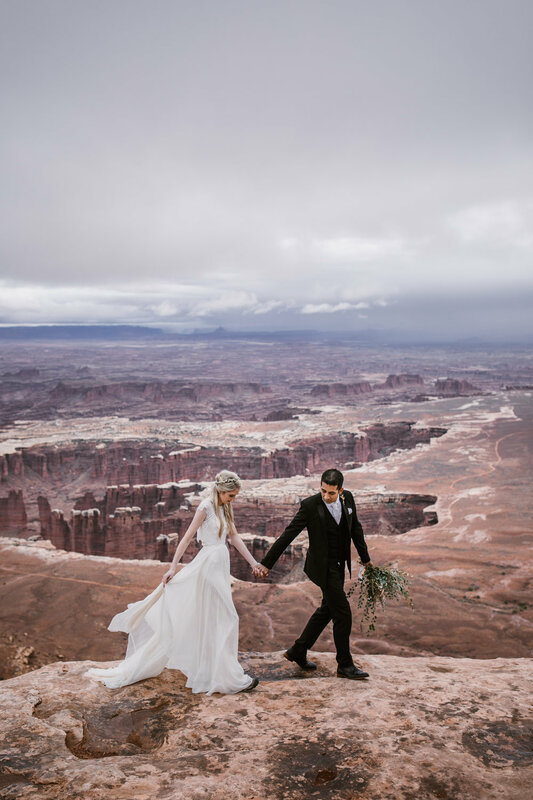 So, whether you want to combine your elopement with your honeymoon in a rad destination, or you’re getting married else where and want ideas for the most amazing honeymoon location, I want to put Amangiri on your radar. What is Amangiri? It’s part of the Aman group of luxury, high-end resorts all over the world, and this one is in Canyon Point, Utah! Yes…UTAH. The Aman Resorts are something else. They truly feel out of this world, while simultaneously perfectly blending with their surroundings. There are 33 different destinations in 21 countries in the Aman Resort luxury hotel group, and each of them has its own unique vibe. The luxury resorts have a small number of rooms, typically less than 55 and often much fewer. They also have a very high staff to guest ratio, which keeps their service top of the line, even among other high-end resorts. 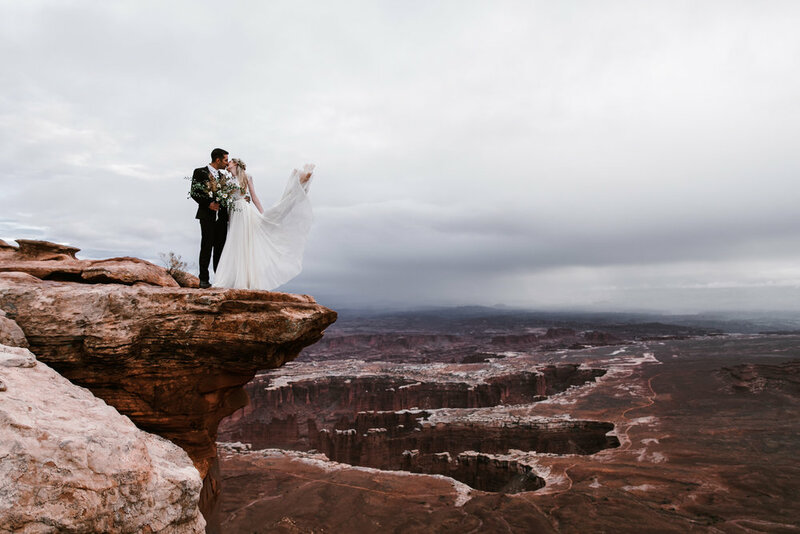 Each resort has an individual name beginning with Aman, such as Amanpuri in Phuket, Thailand (the first Aman Resort), Amangani in Jackson Hole (a major bucket list destination for us as adventure wedding photographers! ), Amanzoe in Greece, and so on. These resorts are designed with utmost attention to detail, each framing the natural setting surrounding it. They are well known for ample space, gorgeous architecture, and peaceful privacy for each guest. Aman Resorts feel much more like going to stay at the home of a close friend (one that’s an amazing host!) than a hotel. If you think deciding what Aman Resort to stay at is difficult, this article naming the 10 Most Fabulous In the World might help, and I can personally say I believe Amangiri, in Utah just north of the Arizona border near Page and Lake Powell, is one of the most beautiful places I’ve ever been. 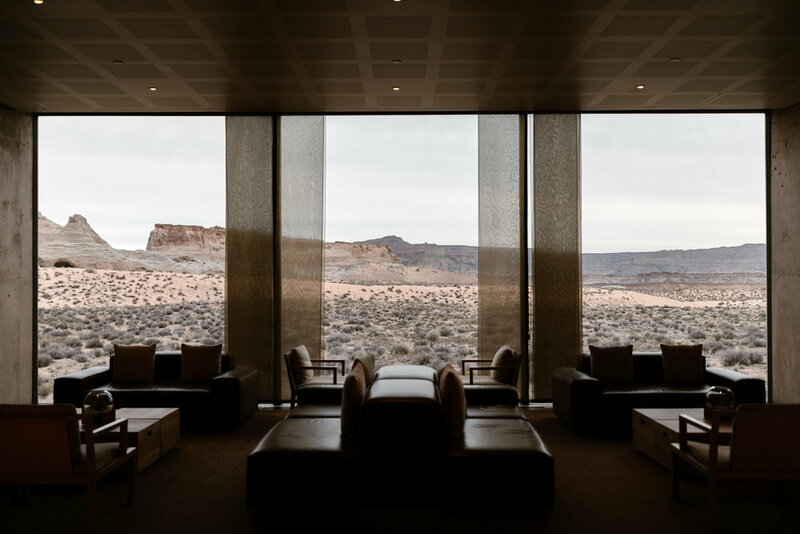 Amangiri is nestled on 600 acres deep in the Utah desert and despite being just a half-hour from the small but well-known town of Page, Arizona, this resort might as well be on the moon. It feels so tranquil, so quiet, and with each room facing out into the desert, you could convince yourself you’re the only one out there as you watch the sunrise through the giant full-sized windows from your bed. The resort itself offers an incredible spa with a focus on wellness founded in healing traditions carried through Navajo culture using the four elements of earth, wind, fire, and water. In addition to the luxury spa, the food at Amangiri is provided throughout the day offering American Southwest cuisine made primarily from locally sources ingredients selected by their chef. The dining experience is extremely romantic, surrounded by floor-to-ceiling windows overlooking the vast Utah desert. The property also offers multiple hot tubs and a beautiful pool (heated in the winter) that is literally built around a protruding sandstone fin off the mesa nearby. 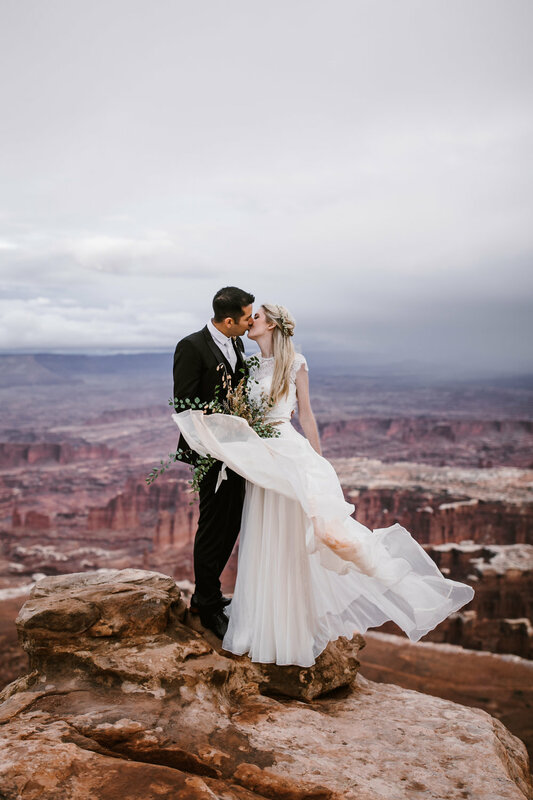 And if you think the allure stops there — you’re forgetting that this blog is written by an adventure elopement photographer! Something unique about Amangiri is the vast amount of adventure experiences they offer both on-site (remember 600 acres of Utah desert!) and in the surrounding areas. Amangiri is located right in the Grand Circle and has easy access to Grand Canyon National Park, Bryce Canyon National Park, Zion National Park, Monument Valley, Lake Powell, Horseshoe Bend, and Antelope Canyon (just to name a few!). 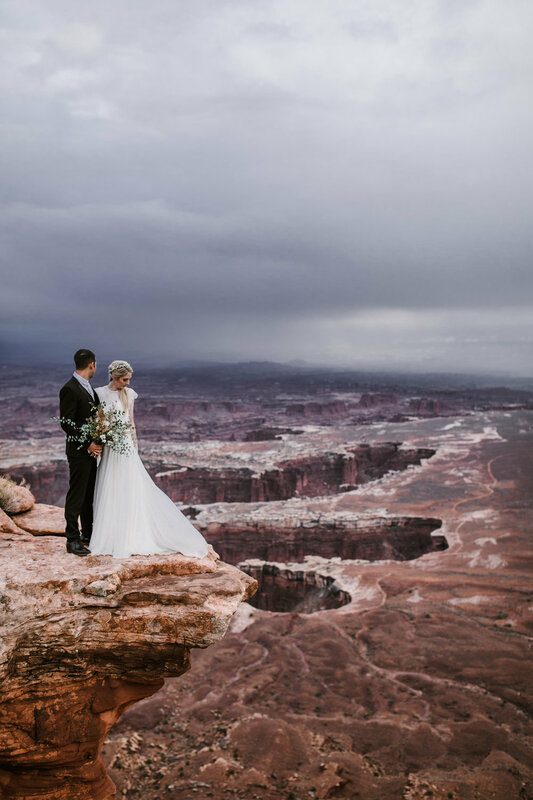 On the property, there are multiple hikes ranging from short and easy to long and challenging, activities like horseback riding, and even a few via feratas that take you through slot canyons, up cliff sides, and across gorgeous suspension bridges stretched between the sandstone mesas. If you’re interested in taking to the sky, Amangiri offers helicopter tours to the surrounding parks, hot air balloon rides, and even a helicopter landing for sunrise yoga on a mesa high above Lake Powell. Amangiri is also a great resort to stay at if you plan on a touring hike through Arizona’s famous Antelope Canyon or a hike out to Horseshoe Bend. I could stop there, but lastly, I’ll mention based on our personal experience something that really stands out about Amangiri (and I’m sure all Aman resorts) is how much the employees truly love their jobs. The ones we worked with were extremely passionate about what they were doing, which I think speaks so strongly about a company! 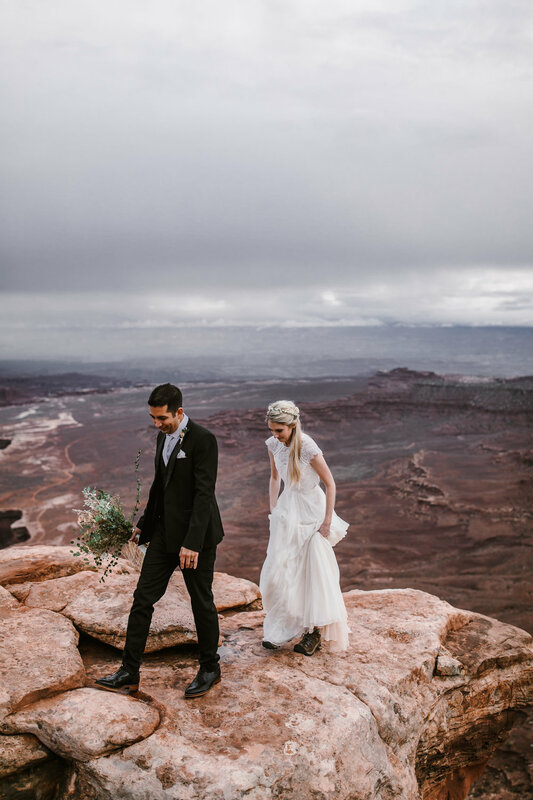 Whether you’ve decided to combine your elopement with your honeymoon and do it all together, or you got married elsewhere and want a high-end luxury honeymoon destination, Amangiri is such a great option. I know when wedding planning starts, it can feel overwhelming to also budget for a honeymoon, but I would honestly urge you to consider the honeymoon as an extremely valuable and worthy place to splurge! 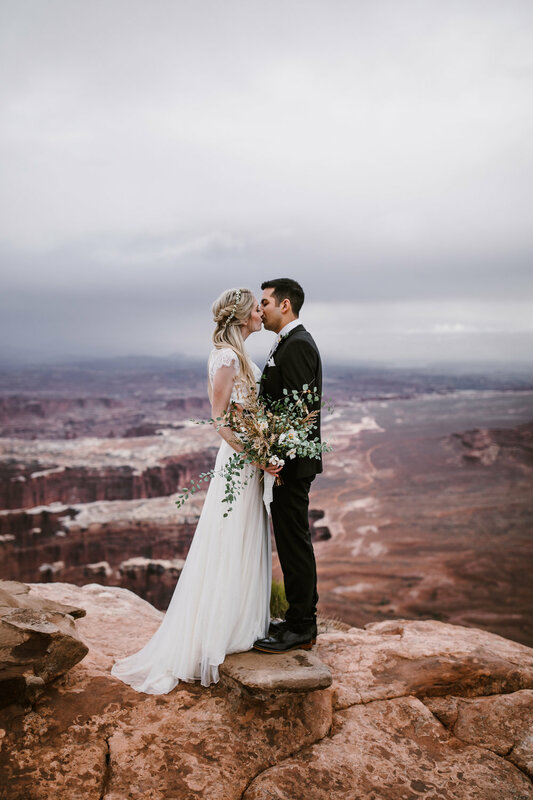 In the end, the reason you’re getting married is because of how much you love the person you’ll be doing this with, and what better way to celebrate that love than a relaxing, rejuvenating, adventure-filled trip together? I’m guessing if you’ve found yourself on our blog, you love travel and adventure is extremely important to you. We agree, which is why we reccomend Amangiri in Utah for a luxury, destination honeymoon location. You’ll get the perfect mix of high-end dining, spa treatments, lodging, and more, combined with some of the world’s best adventure right at your doorstep - literally! I mean how many resorts around the world can offer over three National Parks, world-famous canyons and hikes, and high-end luxury treatment all in one place? Not many, which is what makes Amangiri stand out. If you choose to have your honeymoon at Amangiri, not only will you be pampered beyond your wildest dreams, you’ll also get to try new adventures, push your own limits and comfort levels in the outdoors, and see some of the world’s most stunning landscapes. It’s the best of both worlds, combing rugged and exciting adventure that will get your adrenalin pumping, with an extremely relaxing and high-end home base to massage out all those sore muscles. You can wake up and start your day watching the sunrise from your bed (or turn on the fire outside and sip coffee on the porch), go on a quiet hike around the property, eat the most delicious breakfast you’ve ever had, take a helicopter tour over the Grand Canyon, come back for lunch and spend the afternoon in the spa, wrapping up just in time for a walk up to the top of the nearby mesa for sunset followed by, of course, a romantic dinner you’ll still be thinking about for months after you get home. 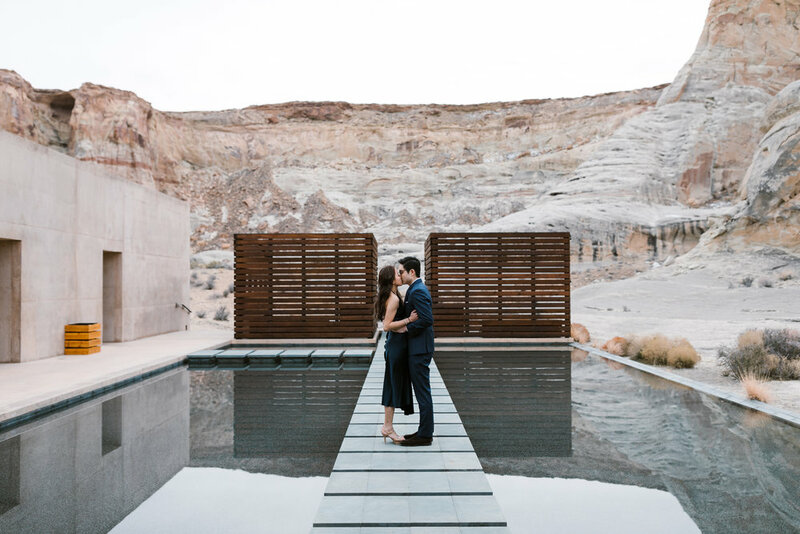 It’s no surprise Aman Resorts have a “cult following” and I’m guessing after your honeymoon at Amangiri, you might decide to visit a different Aman destination for each anniversary following! And lastly, did you notice the gorgeous photos throughout this post? 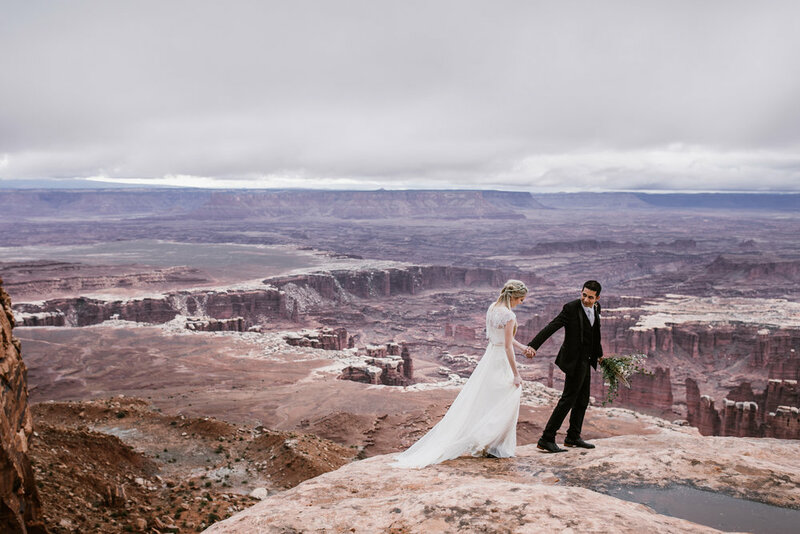 If you decide to splurge on a honeymoon (or elopement + honeymoon combination!) to Amangiri, I highly reccomend hiring a photographer for one of your days there! 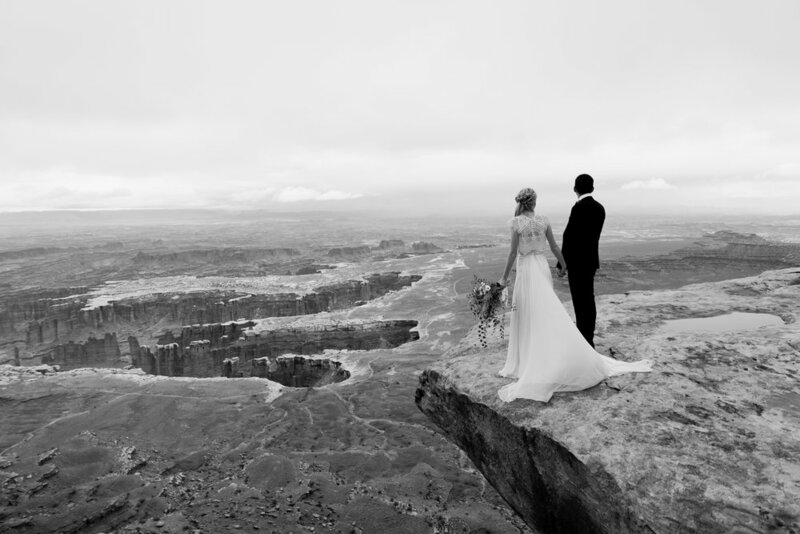 As adventure wedding photographers, we specialize in photographing couples in love. We typically spend a whole day or half day with our couples, balancing between candid photos of them enjoying the adventures they’ve planning and offering some more posed photos as well to ensure they go home with a stunning and diverse collection. We are familiar with the Amangiri property, experiences, and staff, as well as the surrounding parks! 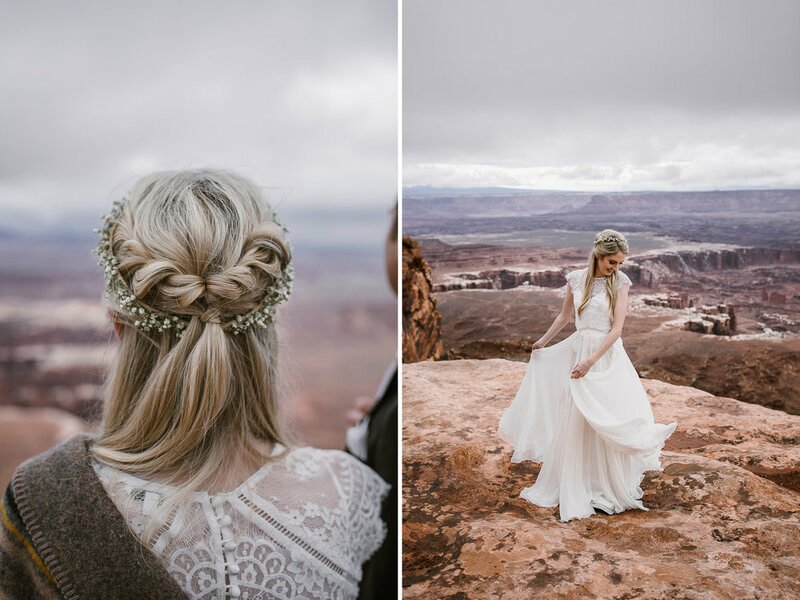 We’ve photographed engagement sessions in Grand Canyon National Park and Monument Valley, as well as an adventure session in Antelope Canyon, and a couple of elopements in Page near Lake Powell. We’ve also shot on Amangiri’s property — we took all of the photos you see in this blog post! 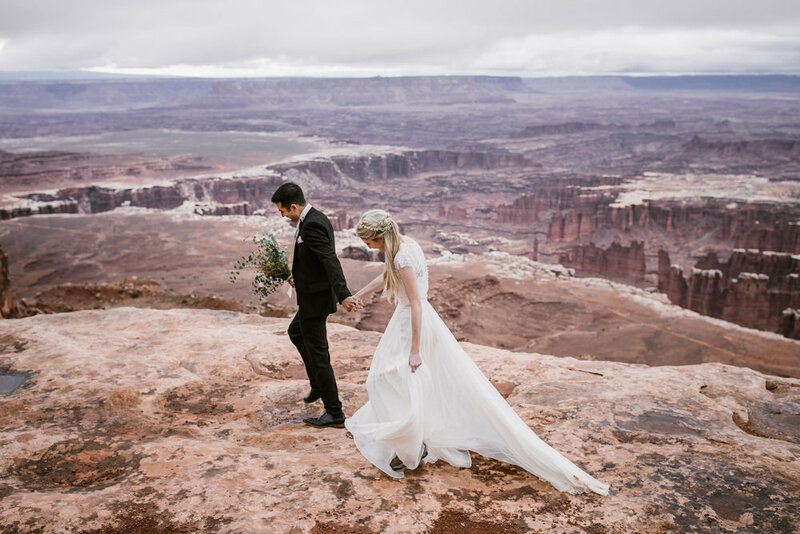 So, if you decide on a trip to Amangiri for your honeymoon, I’d love to chat about a half-day or full-day photo session to capture your love and preserve these memories for years to come. You can get in touch with us via our contact form by clicking this link. I hope to see you at Amangiri soon! 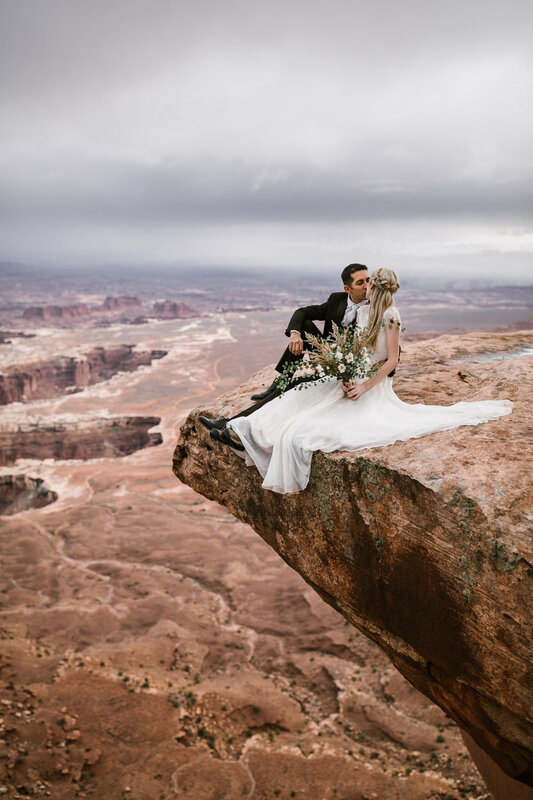 If you would like to learn more about Amangiri or want our help photographing and planning your destination honeymoon or adventurous elopement at any Aman Resort or elsewhere, contact us and let’s make this happen! We can’t wait to hear from you!